We usually do not eat a lot of desserts, but I do love fruit, whether it be fresh or poached like this recipe. You could poach fresh fruit in many types of wines, but I used a sweet Marsala wine in this version. An Italian Moscato would be a good substitution for the Marsala, although the pears would turn out lighter in color. I had some dried blueberries in my pantry I wanted to use up, but raisins would work well in this recipe as well. 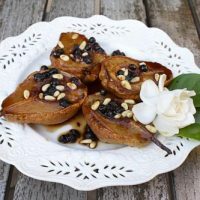 We enjoyed these pears warm after dinner one evening and although they were delicious, I was wishing I had some vanilla gelato in the freezer as they would be delicious served warm with ice cream. We chopped up the leftovers and stirred them into our porridge the next morning and really enjoyed them that way as well. Do use pears that are slightly under-ripe so they do not fall apart during the cooking process. The cooking liquid will thicken and turn into a delicious syrup when the pears are cooked. 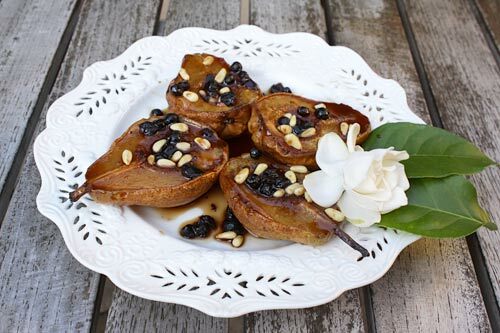 A wonderful light dessert featuring fresh pears in a delectable Marsala wine syrup. Cut the pears in half, and using a small spoon, scoop out the core. Place the pears cut side up into a casserole dish large enough to hold all of them. Spoon the blueberries (or raisins) around the pears. Pour on the Marsala wine, water, and lemon juice and bake for about 20 minutes, spooning the liquid over the pears from time to time. Add the pine nuts, and continue to cook until the pears are tender.